Picture Paris in the 1920s: bustling with painters, writers, and musicians. It was during that decade that an industrial building was constructed in the city's 11th arrondissement. But then came the 1980s, and the property became a victim of a renovation that transformed the structure into unsightly offices. 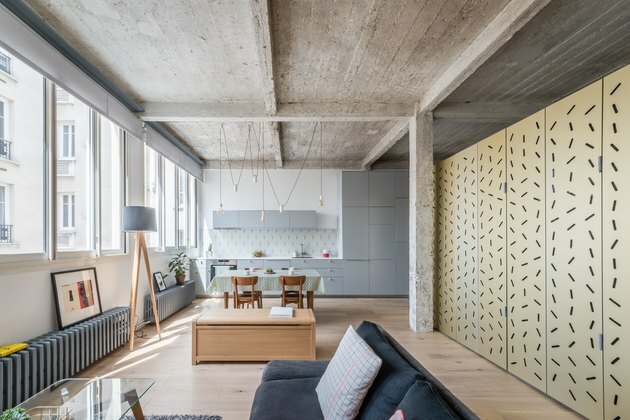 Eventually, it was turned over into living spaces, which brings us to an 800-square-foot apartment revitalized by design firm SABO Project. 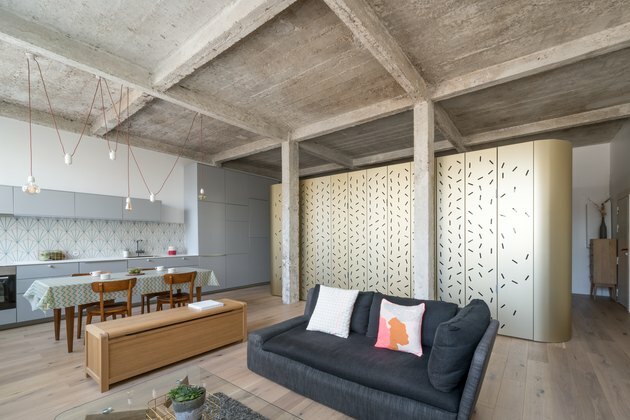 The team began by stripping away layers to expose the beauty and industrial elements that were laying within. "The driving image in our mind was the jewel in a grotto," Alex Delaunay, the firm's principal designer and founder, said. Once the space was exposed to its bare bones — essentially a concrete box — SABO placed an iron structure in the middle of the home. 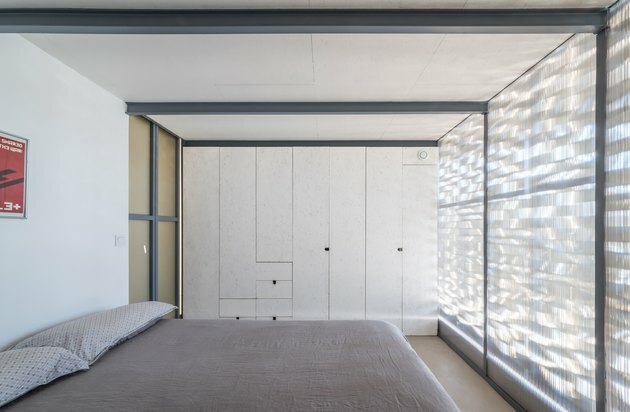 Clad with perforated aluminum panels, the piece creates a dazzling light effect and conceals a bedroom and bathroom. 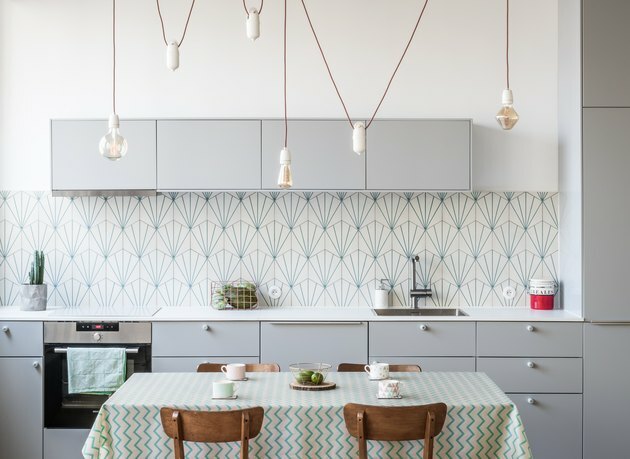 White pulley porcelain pendants from Zangra hang in an asymmetrical pattern over the kitchen table. Beams and concrete pillars were left over from the property's original build. 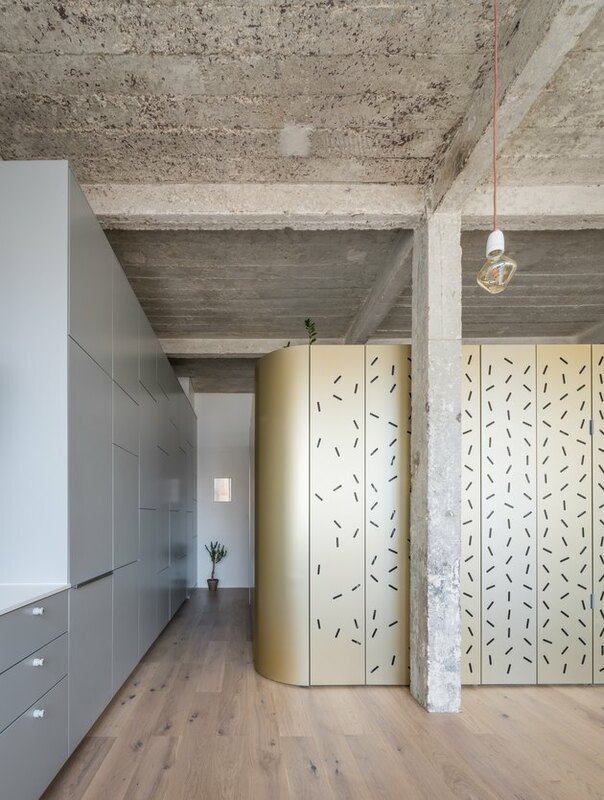 "The island strategy allows for the perimeter walls and ceiling to run uninterrupted throughout the apartment. It also helps create a looping circulation that emphasizes the sense of space as a single whole," Delaunay said. Gray paint was used on surfaces to harmonize with the bones of the apartment, making the island the focal point for the space. "The use of color is focused solely on the island and its anodized champagne panels," Delaunay explained. 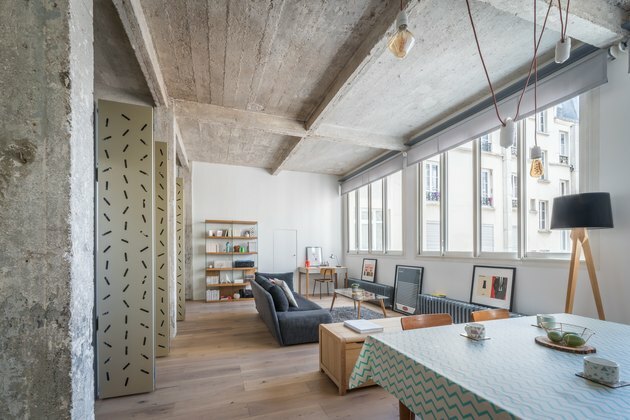 Wide plank wood floors soften the surrounding concrete columns and ceiling beams. The central island was custom-made by applying forty aluminum sheets on a metal structure. "The perforations are intended as a light filter that, along with the corrugated polycarbonate sheets, provide both natural light and privacy to the spaces within in the island," Delaunay explained. Cement tiles from Marrakech Design line the backsplash in the kitchen. An Andano sink from Blanco is installed with a minimalist Grohe Minta faucet. The guest bedroom is tucked away on top of the island. 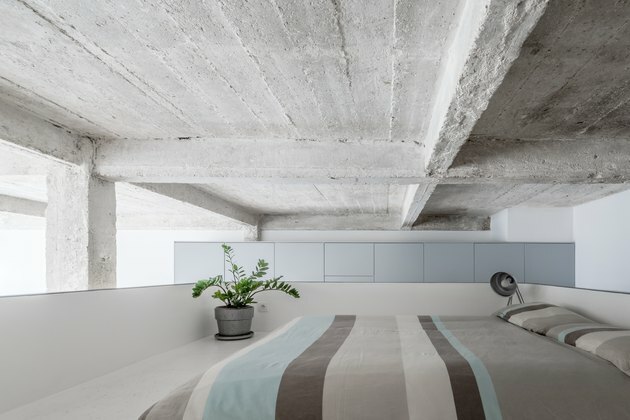 The white flooring makes the narrow bedroom appear larger. "Before the renovation, the bedroom and bathroom were in a corner of the space and getting very little natural light," Delaunay said. 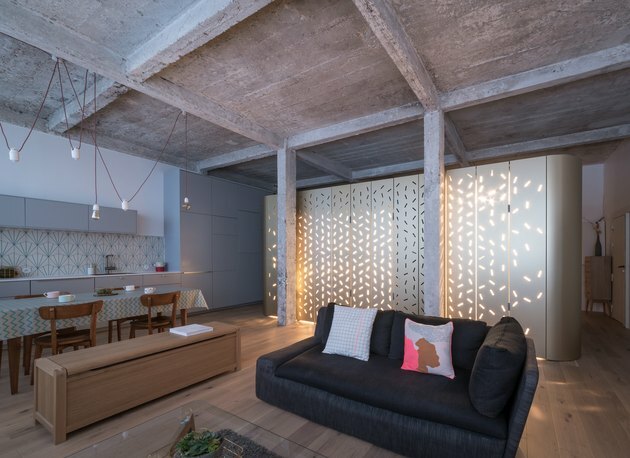 Now, the natural light shines through transparent panels, which create a more romantic and comfortable appeal. 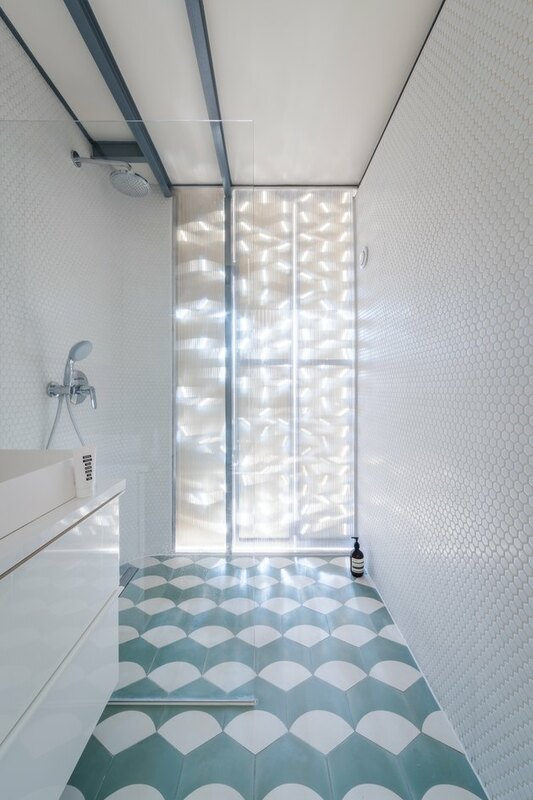 The bathroom displays an interesting combination we'd never think of — hexagonal mosaic tile on the wall, with diamond-shaped tile on the floor.